. 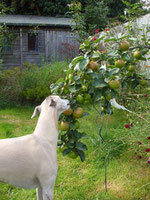 . . . . . . A DOG'S YEAR IN THE GARDEN . . . . . . . Snow, frost, and even rain can all create treacherously slippery surfaces to walk on, so take particular care when out in the garden. With four paws your dog may be better at keeping his balance than you, but he can still experience difficulties, so encourage him to take things things slowly when crossing surfaces which are likely to cause problems such as patios slick with ice or wet algae. FEBRUARY . . . . . . . . . . . . . . . . . . . . . . . . . . . .
A quiet time of year in the garden - and without too many jobs that need doing outdoors it is the perfect time to plan for the year ahead. Sort out packets of seeds which are still viable, and make a shopping list of anything you need to buy. 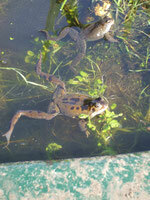 The air is filled with the sound of froggy singing, and the first clumps of frogspawn are appearing. For the safety of the dogs, my pond is sited in the front garden which they don't have free access to: but it's near a window so they still get to watch all the activity going on out there. 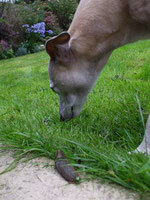 Unfortunately the antics of the frogs - seven of them at last count - also attracts the interest of the local cats. Happily no casualties so far this year: Archie and Angel have been keeping a close watch on proceedings and alerting me to the presence of any feline intruders who are then sent packing with a well aimed squirt of water. If you don't have a water pistol, I've found that a plant sprayer with the nozzle adjusted to give a fine jet rather than a spray makes a great substitute, with a surprisingly good range. Cat lovers may think I'm mean, but the frogs are grateful! APRIL . . . . . . . . . . . . . . . . . . . . . . . . . . . . . . .
April showers, and the slugs and snails are out in force - as well as being the gardeners worst enemy, they're no friends to your dog either. Lungworm (Angiostrongylus vasorum) can be caught from these slimy pests, and is a problem which, once seen only in a few isolated pockets is now spreading rapidly across the UK. Some of the contributory factors for this spread are thought to be due to global warming encouraging slugs and snails to remain active for longer periods, combined with the movement of dogs around the country and foxes becoming infected (slugs and snails form part of their diet) and acting as a source of infection for dogs - remember that nowadays foxes are urban as well as countryside creatures. 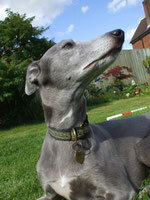 Have a chat with your vet about the possible risk to your pet, and work out a suitable worming programme. Spring has definitely sprung and with some warmer and drier weather at last, it's lovely to be able to spend more time outside. 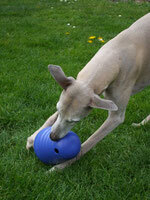 There's plenty of weeding to catch up on and seeds to get sown, while the dogs amuse themselves with some activity toys. While Archie and Angel are busy batting their treat-filled pyramid toys around on the lawn, trying to get the goodies out, I can get on with some of the long overdue garden chores without having to keep a constant eye on what they are up to. JUNE . . . . . . . . . . . . . . . . . . . . . . . . . . . . . . . .
With the arrival of 'flaming June' it's time to start keeping a close eye on dedicated sunbathers who don't know when they've had enough. Soaking up the sunshine is a favourite occupation for many dogs, but they can be just as prone to sunburn and heatstroke as us. The young, the elderly, those with short noses or medical conditions such as heart problems are particularly susceptible to overheating so err on the safe side and send them off to nap in a cool, shady place instead. A grassy lawn not only looks good but helps the environment too: The Lawn Institute states that it can help reduce carbon dioxide emissions and contribute to reducing global warming trends. A healthy lawn also has a wonderful cooling effect, which according to a study by one US University is equivalent to an 8.5 ton air conditioning compressor. On a hot summer day, lawns can be up to 30° C cooler than asphalt and 14° C cooler than bare soil. And of course, it's a forgiving and pleasant surface for playing games or simply lounging around on, whether you're a human or a dog! AUGUST . . . . . . . . . . . . . . . . . . . . . . . . . . . . . . When it's too hot to do much, it's time to bring out the paddling pool. A plastic clam shell works well, as doggy toenails won't puncture it like the plastic inflatable type - but do place a non-slip bath mat in the bottom. Lisa loved playing in the river, but when it dried up during droughts happily accepted this as a substitute. 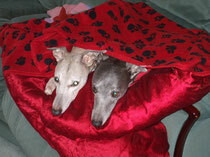 You may need something bigger for larger dogs; it's possible to buy canvas ones which do the job nicely. Buy some doggy water toys or float some pieces of frankfurter sausage on the surface of the water to add to the fun. Fruit is ripening fast now - on the allotment we've already enjoyed a bumper crop of plums, damsons and cherries and are now looking forward to apples and pears. Wasps may be as well, so if you have a tree in your garden, clear up any windfalls which may attract them - as well as helping your dog to avoid stings it will prevent him from gorging on the fallen fruit too. Remember that some fruit (such as grapes) can be poisonous to dogs, which is another good reason for preventing him from harvesting his own. Those with stones or large pits can present an additional problem - as well as being potentially toxic, they may also cause blockages in the gut if ingested. OCTOBER . . . . . . . . . . . . . . . . . . . . . . . . . . . . . Fallen leaves rustle crisply beneath feet and paws: the year has raced by and Hallowe'en is here already. Check carefully under bonfires of garden rubbish to make sure no hedgehogs are hibernating underneath, and leave your dog safely indoors before lighting them. If trick-or-treaters are likely to call, it may be a good idea to put your dog on the leash or to leave him safely shut in another room when you go to answer the door. Even though he may normally love visitors, he may be less welcoming to those who appear in ghoulish fancy dress and uttering ghostly sounds. Remember remember the Fifth of November ... and make sure you keep your dog safely indoors while the fireworks are going off outside. Even when you think they are safely all over, it's a good idea to take your dog out for his late night wee in the garden before bedtime on a leash, just in case. Even though your fencing may be both high and secure, a panic stricken dog may succeed in escaping. DECEMBER . . . . . . . . . . . . . . . . . . . . . . . . . . .
A covering of snow creates a whole new and exciting landscape, and most dogs will enjoy scampering around and playing in it. Some may need a warm coat if they are going to be out in the cold for more than a few minutes to answer the call of nature - and some may refuse to go out even for that long, without a cosy jacket to keep the chill at bay. 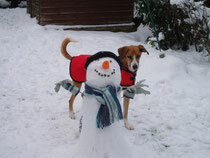 Well wrapped up, Ziggy, the dog in this photo, had great fun helping his owner Hayley and her daughter make a snowman. Soon after taking this shot, Hayley noticed something was missing ... and then spotted Ziggy eating the snowman's carrot nose!